Recent flood impacts and forecasts: how well did we do? 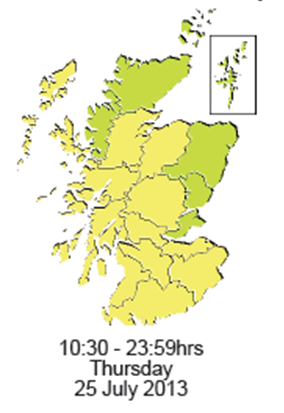 You don’t have to look very far over the past few weeks to find people complaining about being caught out by heavy rainfall and flash flooding that wasn’t forecast, however the forecast from the Scottish Flood Forecasting Service and the Met Office has been for isolated heavy showers with the potential to cause significant disruption. In reality this means that some places might stay dry and sunny all day, while just down the road a flash flood occurs. Although it may sound like we’re hedging our bets, as discussed in the previous posts on flash flooding (1,2,3), it really is very difficult to pinpoint the exact location of the heaviest rainfall in advance so for surface water events this is a reasonable forecast and impacts should be expected anywhere across large areas of the country. Take for example the flooding in around Glasgow on 25th July. Our FGS identified a medium likelihood of minor disruption and a low likelihood of significant disruption. A flood alert was in place for West Central Scotland. Around 5pm Greenock experienced in excess of 20mm of rainfall in an hour. 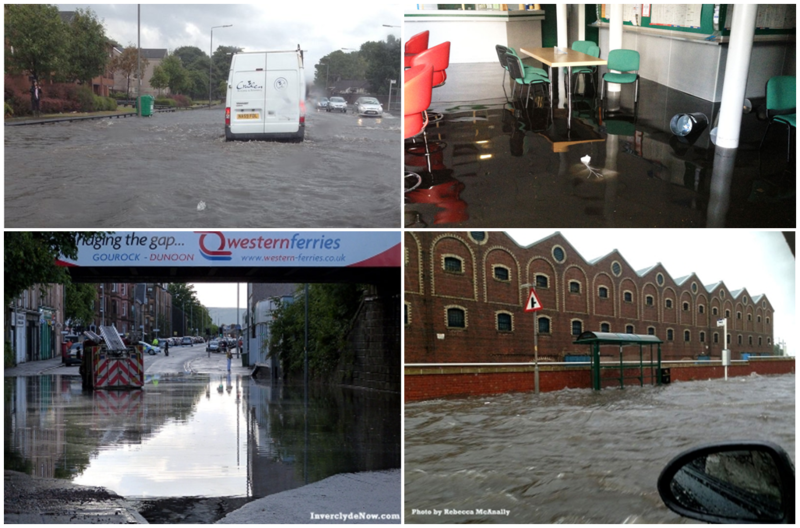 Impacts included flooding of roads and isolated properties including a shopping centre. The fire service received 23 flood related call outs (The Scotsman). Based on our impact matrix definition this event caused minor disruption with local agencies (the council and fire service) able to deal with the impacts. So I would conclude that we had correctly forecast this event and the public and responders were alerted in advance to the potential for surface water flooding. A similar story occurred on 28th July. Again the FGS and Flood Alerts were highlighting the risk of heavy isolated showers and residents in Camelon near Falkirk experienced flooding in their gardens (BBC News). Throughout the week there was local disruption to transport across Scotland with surface water slowing traffic and roads closed at known flooding hot spots. Luckily the heaviest showers forecast have not come to fruition, but the spell of showery weather isn’t over yet so we could see more impacts before the end of the summer. Don’t forget that many of the biggest impacts from flooding occur during the summer months. For example Glasgow experienced floods in July 2002, June 2007, August 2011 and July 2012, so it shouldn’t come as too much of a shock when we see flash flooding in the summer. This entry was posted in Flood, Forecasting, Surface Water. Bookmark the permalink.